Looking for the Best iPhone Vampire Games? Whether you are drinking True Blood or sparkling in the sunlight with the pre-pubescent crowd from Twilight the vampire scene is booming. The iPhone, as a common barometer of everything pop culture, has drifted toward the vampire fare without missing a beat. The iPhone game department, especially free iPhone games, is now smash full of the undead and the numbers are likely going to increase. With the numbers doubling at a rapid rate, it’s hard to figure out what the best iPhone vampire games are without a timely list. Here are some of the best iPhone vampire games available at the iTunes App Store, both free and costly. If there is one mammoth combination of mega-giants in the world of iPhone gaming it is iVampires Online. iVampires Online combines the free text based iPhone MMO RPG format from The Godfather with a vampire theme that draws heavily from traditional eastern European folklore. 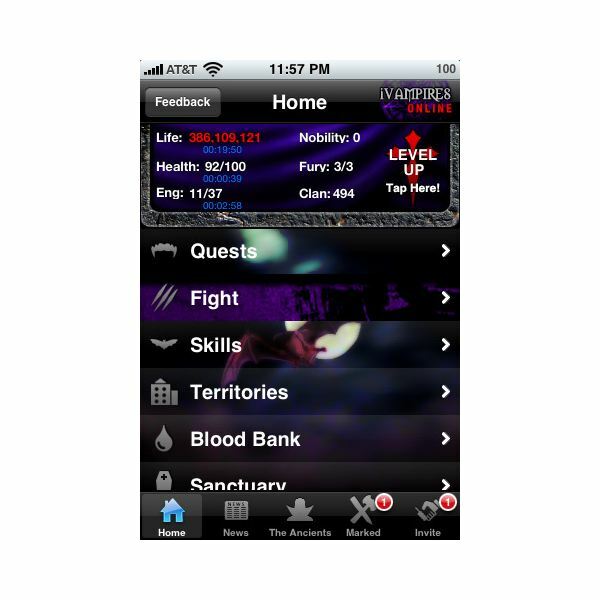 iVampires Online essentially takes the iMob Online engine into a dark area, but there is a complete system of traditional RPG elements. You will complete jobs for experience and "blood," which acts as currency. You will purchase slaves as a form of real estate investment. What does mark games from The Godfather, and iVampires Online, is the iVampires Online Nobility Points. iVampires Online Nobility Points are purchased from The Godfather with real money and then used to buy things inside iVampires Online that you would normally have to wait or work for. iVampires Online Nobility Points actually allow you to cheat in iVampires Online, but only if you can spend the money to buy iVampires Online Nobility Point packages. What has maintained the popularity of iVampires Online is the constant updates released by The Godfather, the connections and free iVampires Online Nobility Point packages offered by connecting with other games, and the iVampires Online Friend Code system. This iVampires Online Friend Code system assigns your iVampires Online account its own unique Friend Code and you will maintain that Friend Code permanently. People then use these iVampires Online Friend Codes to add people to their clan, which is why you will find forums online for sharing iVampires Online Friend Codes all over the Internet. Check out iVampires Online if you want a long term playability with only limited spurts of interaction.This may be the perfect format for free iPhone games. The Vampire Slayer iPhone game is only for die hard Buffy fans, which splits the iPhone gaming crowd. If you remained addicted to Buffy The Vampire Slayer all through its seven season run, then you are going to find the Buffy game a good choice, but otherwise you will want to stay away. Buffy The Vampire Slayer for the iPhone does run for $0.99, but since Buffy fans will have so much fun with it, the price is well worth it. Do not expect much more than a question and answer set up, but have fun trying to remember who told Angel they wanted to die. This is only one of the best iPhone vampire games for a small crowd, but it may put it far above the rest to that number. killed kind of virtual world. iDracula Undead Awakening is exactly this type of title. What iDracula Undead Awakening does well is draws from the hack and slash of earlier action RPGs and platformers that were made so popular on arcade machines and the Super Nintendo Entertainment System. In iDracula Undead Awakening you are supposedly a vampire hunter, though the table is often turned on you. There are so many levels and enemies in here that you will feel as though you jumped into an entire encyclopedia of folklore, ranging from the expected vampires to werewolves and other types of monstrous assailants. You will have serious firepower that will even include futuristic rocket launchers obviously used in the guerrilla rebellion of Mars. As your life bar runs down you will have to frantically attack those around you, use potions to restore yourself, and monitor the map to your upper right hand corner to see where everyone is. iDracula Undead Awakening is by no means something you have never seen before in gaming, but it takes this tried and true formula and executes is well. You are going to find the graphics of iDracula Undead Awakening good, if not great, even though it does not attempt to jump into the real 3D world. This is an iPhone game that is well worth the $2.99 price tag and it really earns its spot on the list of the best iPhone vampire games even if it is not of the true iPhone RPG fare. against Dracula and his accomplices. In MonsterKill you will have to fight vampires and other creatures of the night as they waddle toward you. 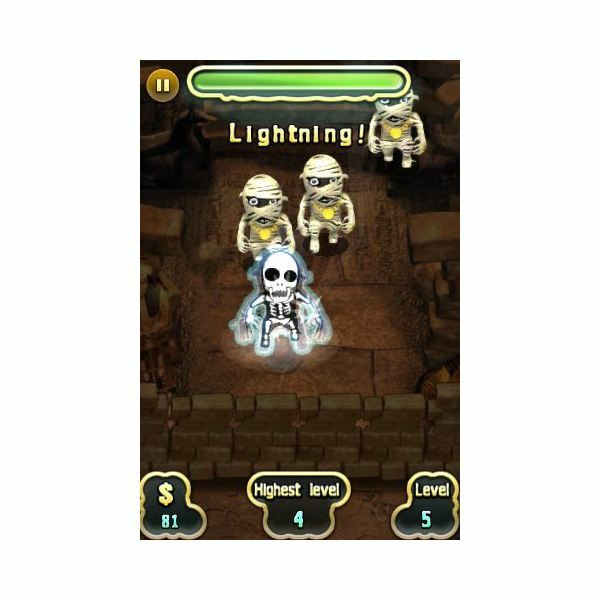 You do this by attacking with different weapon-like effects, such as a lighting or fire that can strike down these undead attackers. In reality, MonsterKill works like an action puzzle game of an arcade tradition more than an adventure title like iDracula Undead Awakening. This is going to make MonsterKill one of the most addictive of the best iPhone vampire games for those it speaks to. You will have the ability to constantly challenge yourself with MonsterKill, and its short blasts of gameplay are perfect for killing time. What is great about this system is that it really gives you something to brag about as you get more money and leave less and less monsters alive. The fact that MonsterKill is on the Open Feint network only adds to this ability. MonsterKill is well worth the $0.99 you will spend on it. Also Check Out: The Creeps!, Skullpogo, Ghosts’n Zombies, The Vampire’s Kill, and Undead Vampire Slayer for some of the best iPhone vampire games. Articles about the best of certain iPhone game genres.